Beautiful mountains, a quaint village nestled into a valley, waterfalls, and a stunning castle perched above it all: with a description like that, is it any surprise that our Munich to Neuschwanstein Castle day trip completely lived up to the hype? When I was at university, I had never been outside the USA before–but I already had major wanderlust, and I displayed it all over my dorm room. Posters of Paris, Kyoto, Machu Picchu, New York all adorned my walls… and so did Neuschwanstein Castle. At the time I bought the poster, I didn’t have any idea where Neuschwanstein Castle even was, couldn’t spell the name if I tried, and certainly didn’t know about the rumors that it inspired Walt Disney when designing Cinderella’s Castle–a place that I visited more times than I could count when I lived in Orlando as a child. Even still, though, my wandering feet eventually led us there: during our time in Germany (which is chock full of fairytale castles), we learned that it would be fairly simple to add a day trip to Neuschwanstein Castle to our Munich travel itinerary, and we immediately set about making it happen. If you’d rather not eat up one whole day in Munich with a tour group for your day trip to Neuschwanstein Castle from Munich, don’t worry! Getting there independently is fairly simple, though it does involve a few steps. If you have a car, you can ignore all the public transportation advice and focus only on the castle itself. First things first: if you want to tour the interior of the castle during your day trip to Neuschwanstein Castle, you’ll need to reserve tickets in advance from the castle’s official website here. The tours do regularly sell out, so we recommend booking as far in advance as you know your dates, ideally at least several days ahead of time. The ticket you purchase will be for a specific tour time, so once you have it in hand, you’ll be better able to plan your day. Tardiness is not tolerated on the tours, so be sure to build plenty of time into your schedule for delays and mix-ups, and to get there early. 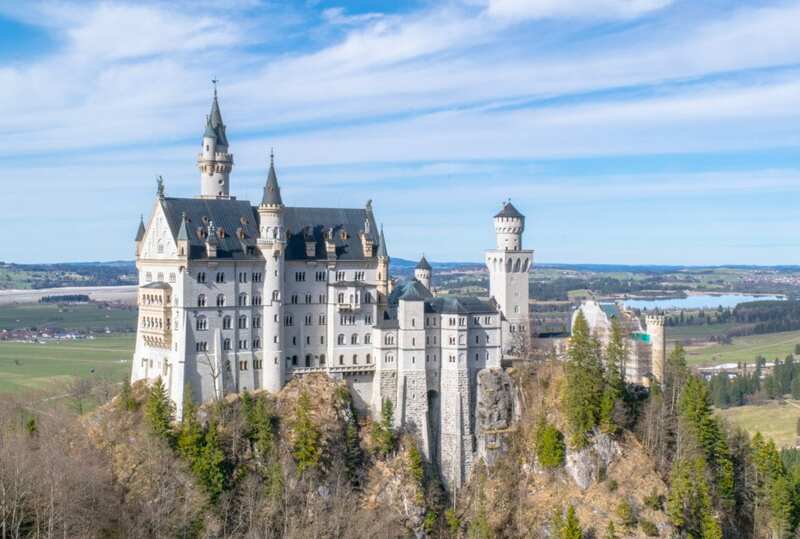 Please note that if you decide to take a tour from Munich to Neuschwanstein Castle rather than visiting independently, that tour likely does not include the cost of admission into the actual castle as part of the package–be sure to read the terms carefully so you’re not surprised! Personally, we chose not to tour the interior of Neuschwanstein Castle during our day trip–the interior of the castle is largely unfinished, as King Ludwig II died before it was completed and the castle was opened to the public as a museum shortly after. People who take the tour report mixed reviews, and we opted to spend more time enjoying the views of the exterior and gorgeous surrounding nature instead! For day trippers coming from Munich, Neuschwanstein Castle is accessed from the town of Fussen. In order to reach Fussen from Munich, take a train from Munich’s main station (Munchen Hauptbahnhof, often shortened to Munchen HBF) directly to Fussen. Munich public transportation is very simple to use: six direct trains run per day, and you don’t need to book tickets in advance–as a regional train, you can buy your tickets directly from the station when you’re ready to leave. You’ll want to purchase a regional day pass ticket for Bavaria to save money and for ease of travel. The ticket will cover your train both to and from Neuschwanstein Castle, as well as the bus you’ll take in Fussen. The day pass saves more money the more people you have–as of May 2018, if you purchase one ticket at 25 Euros, you can purchase up to three more at a rate of 6 Euros per ticket. The train ride to Fussen takes about two hours, and enjoy it! The views of the Bavarian Alps and villages that we passed by were absolutely gorgeous–I couldn’t resist snapping dozens of pictures, even though I knew they wouldn’t turn out well through the glass. The town of Fussen knows what the biggest attraction around is, and the town has planned well for the crowds of tourists who descend each day with plans of visiting Neuschwanstein Castle. Once you arrive in Fussen, walk directly out of the train station to the parking lot, where you’ll see 1-2 buses waiting, which will be numbers 73 and/or 78. The drivers will probably be calling out “Neuschwanstein” and corralling the crowds into the right place–they know what you’re there for. These buses are timed to be ready and waiting for train arrivals from Munich to transport those visiting Neuschwanstein Castle. Hop on board, and if you’re at all uncertain that you are in the right place, ask the driver–they were all quite friendly. The ride from the train station to the base of the hill where you’ll start the climb to Neuschwanstein Castle takes about 15 minutes. There’s no way to avoid a bit of an uphill climb on your day trip to Neuschwanstein Castle! To walk to the castle from where the bus drops you off, it’s about a 30 minute, leisurely climb up mostly paved roads–it’s not hard, but it can feel long if you’re as excited to reach the castle as I was! If you’d prefer to cut some of the walking time, you can pay a small fee for a horse-and-carriage ride to get closer to the castle and approach Neuschwanstein Castle riding like royalty! Please note, though, that carriages do still drop you off about a 5-10 minute walk from the base of Neuschwanstein Castle and a 15 minute walk from the most popular viewpoint to admire Neuschwanstein–everyone will have to walk from that point forward. Whether you’re taking a tour of the interior or not, there’s plenty to enjoy once you’ve reached Neuschwanstein Castle! If you’re taking a tour, be sure to arrive right on time and keep an eye on your watch. If you’re simply enjoying the exterior of the castle on your Neuschwanstein Castle day trip, there’s no need to rush: each level of the well-marked walk from the base of Neuschwanstein Castle to the popular Marienbrucke Bridge viewpoint is lousy with gorgeous views: of the Bavarian countryside, of mountains, of lakes, of nearby Hohenschwangau Castle, of Neuschwanstein Castle itself. Soak it all in! Once you read the Marienbrucke Bridge, we recommend continuing forward once you’re done photographing pictures of the famous spot: on the other side of the bridge from where you entered there are numerous short trails, and in just 10-15 minutes you can climb up a bit higher and find even more incredible views of Neuschwanstein Castle–and this time, your photos are less likely to be shared with a hundred of your closest friends. 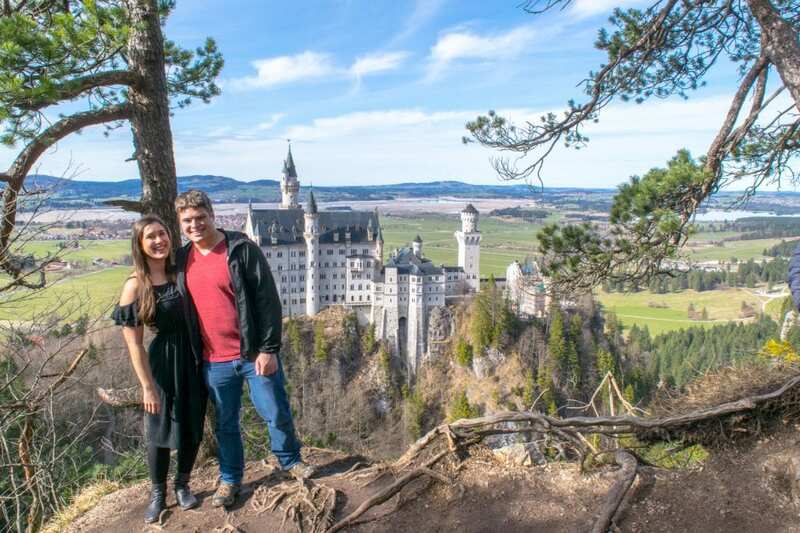 We love the shots we got of the Pollat Gorge, its waterfalls, and Neuschwanstein Castle itself from the Marienbrucke Bridge, but our favorite photos of us with the castle were taken from a higher vantage point. Though a day trip to Neuschwanstein Castle is generally very safe, be sure not to visit without travel insurance! 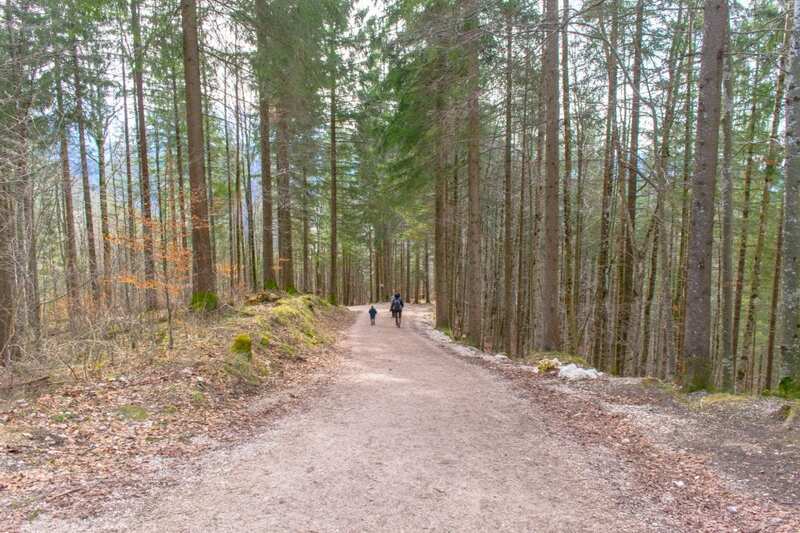 Getting back to the Fussen train station from Neuschwanstein Castle is very easy–simply retrace your steps. Buses 73 and 78 run on a loop from the train station to the Neuschwanstein Castle drop off point, and generally can be expected every 30 minutes or so. Head back to Munich the same way you came! Depending on what time you leave Fussen, you’ll either be able to take a direct train back to Munich, or will have a very quick, simple change about halfway through your travels. 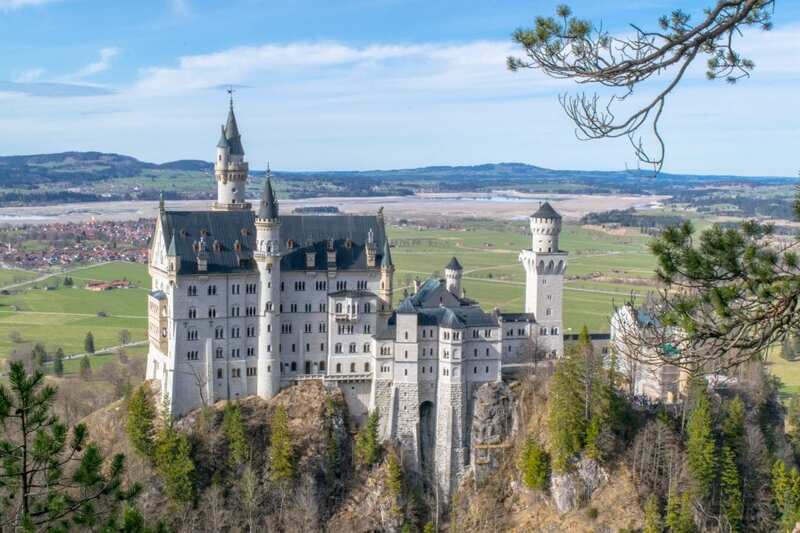 If you’d prefer not to worry about transportation from Munich to Neuschwanstein Castle, there are plenty of tours available that will handle those logistics for you! Please keep in mind that these tours generally do not include the tour of the interior of the castle, so you will still need to follow the instructions above for purchasing tickets to visit the castle ahead of time days before you arrive! This popular tour will handle all transportation concerns for you, and includes stops at a couple of other places in Bavaria throughout the day! Looking for that iconic spot to see (and photograph) the exterior of Neuschwanstein Castle in all its glory? You’re looking for Marienbrucke Bridge, which is the most popular viewing point for Neuschwanstein Castle. Marienbrucke Bridge is a 10-15 minute walk away from the castle once you reach it (the trail essentially loops around the castle), and is easy to find–there are signs all the way there. Once you’re on the bridge, be sure to look behind you, as well–in addition to the castle, there are amazing views Pollat Gorge, its river, and its waterfalls from the bridge, serving as an excellent reminder as to why King Ludwig II wanted Neuschwanstein Castle built in this location in the first place. The downside of the view from Marienbrucke Bridge? You’ll be sharing it with a lot of other people–we even waited in a line to enter the bridge in the first place! Due to that, once you’re done snapping your shots, we recommend crossing the bridge (most people didn’t seem to ever actually reach the other side!) and climb up a short distance on the trails that are directly ahead. In return, you’ll be rewarded with equally stunning views of Neuschwanstein Castle from a slightly higher vantage point and far fewer crowds–we even got a few minutes alone up there! 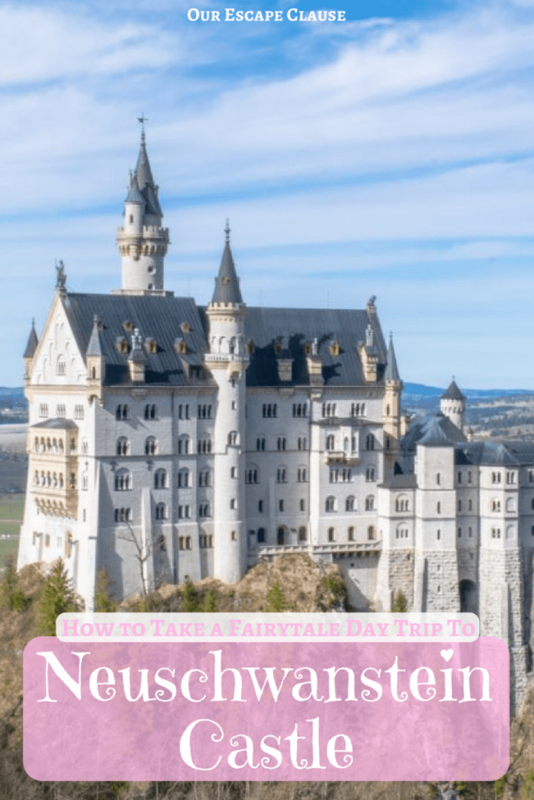 The day trip to Neuschwanstein Castle from Munich is insanely popular–even considering how many things to do in Munich that there are, many visitors determine it worth the trek to Fussen. For best results, there are a few things to know before you go! Get an early (or late) start. Though you’ll never be able to completely avoid the crowds, rumor has it that a very early start (like, arriving an hour plus before the daily tours of the castle start kind of early) can help you avoid the crowds. Unfortunately, going this route means that the Bavarian day pass train ticket won’t be an option–those tickets are only good after 9am on weekdays. Don’t forget about Hohenschwangau Castle! Though Neuschwanstein Castle gets all the love, nearby Hohenschwangau Castle is located about a 30-minute walk from Neuschwanstein and also looks beautiful to visit! Hohenschwangau Castle is the childhood home of King Ludwig II, and where he grew up before starting to build Neuschwanstein Castle in adulthood. 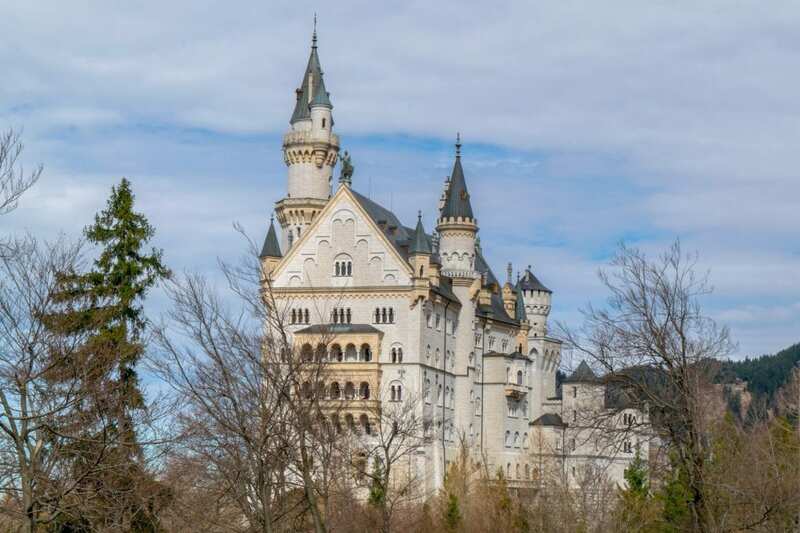 Like with Neuschwanstein Castle, you’ll want to reserve these tickets in advance and only guided tours are allowed–you can’t enter yourself to explore. You can get a very minor, one Euro discount for booking entrance to both castles for the same day. Some day trips to Neuschwanstein Castle that are sold as tours do also include a visit to Hohenschwangau Castle, though not all of them do. This tour includes a short stop at Hohenschwangau Castle (though not the interior) in its itinerary! If you’re a hiker, Fussen is a great place to be. 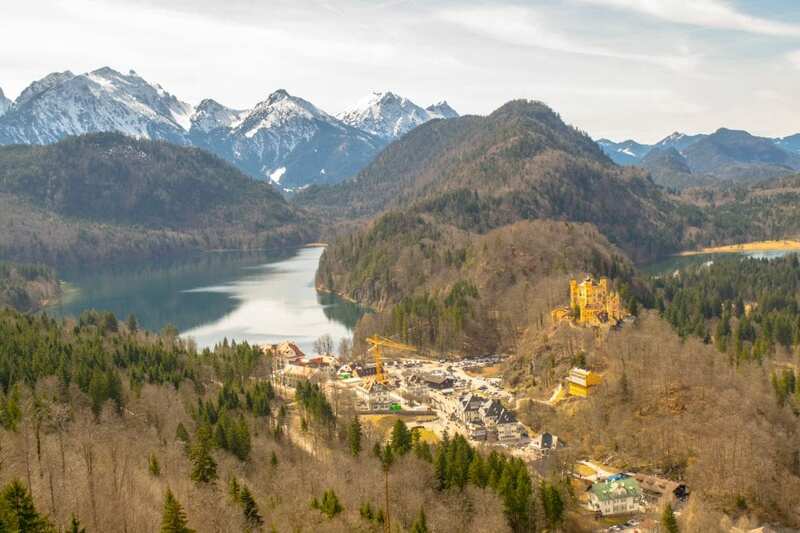 The allure of Neuschwanstein Castle is impressive, but don’t forget about why King Ludwig II wanted it built there in the first place–the castle is nestled among some of the most gorgeous mountains in Germany! 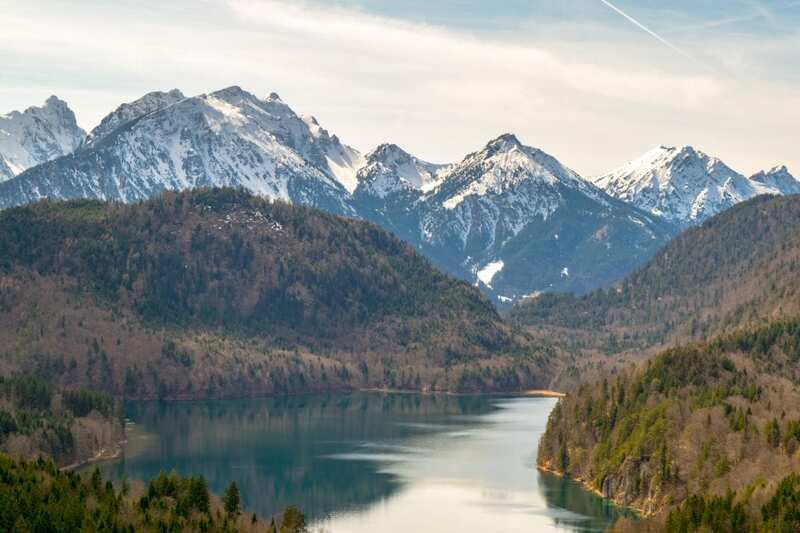 The Bavarian Alps are incredibly beautiful, and there are plenty of hikes near Neuschwanstein Castle to consider if you have some extra time (or even decide to spent a night or two nearby). Marienbrucke Bridge can be closed depending on the weather. The famous bridge and viewpoint were open for us when we visited in early April, but signs from earlier in the year stating the bridge was closed due to weather were still up–so bear in mind that in icy conditions, the bridge (and therefore any trails you reach by passing the bridge) might be closed. It’s a bit of a risk of visiting Neuschwanstein Castle in winter–you risk not being able to access the most popular viewpoint on your day trip to Neuschwanstein Castle, but you also may get to see the castle covered in snow! Never too old to enjoy princess stuff! 😀 I’m sure she’d love it. I saw the most amazing video of the landscape and scenery surrounding Munich the other day and now I can’t stop thinking about it! Your post came at the right time to further my wanderlust even more ha! Ooooh, I bet it was amazing! I’d love to go back and spend longer in the area, it’s magnificent. Thanks so much, Mina! Hope you get a chance to visit soon! I will always recognize this castle for being on my English Textbook in Middle School, haha so silly! This would be such an amazing thing to experience. Definitely on my bucket list! Thank you so much for the amazing tips! Gorgeous! I didn’t realize how beautiful the surrounding scenery was. Thanks for sharing – we hope to visit someday! Thanks for the detailed advice on Neuschwanstein Castle! I live in Northern Germany and will be heading this way in the fall. 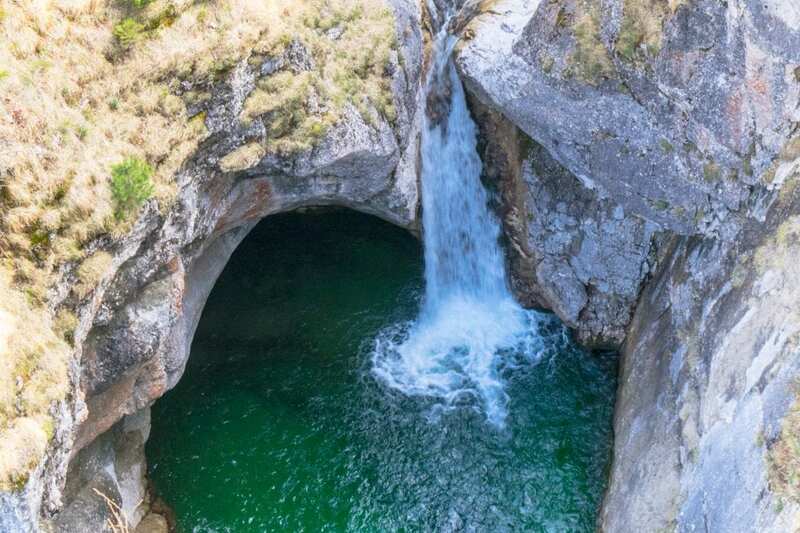 Hoping to just take a day trip here from Munich and glad to know it’s possible! This is so picture-perfect! Reminds me of that Disney castle and Cinderella!! Yes!! Rumor has it that this castle inspired Walt Disney when designing Cinderella’s Castle at Disney World–I can certainly see the similarities! Great choice choosing to see surrounding mountains and lake instead!